For the crowd that showed up at Gasworks, today's ride seemed to be tougher than yesterday's climbing. It was a daunting challenge- ride 33 miles and eat 3 slices of pie. Or, from another perspective, eat 3 slices of pie and get 33 miles of riding worked in between slices. I preferred looking at it that way. 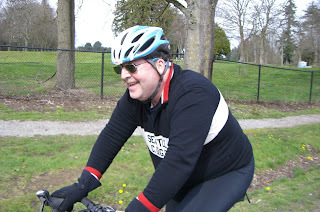 A newbie to the Pie Ride, Bill admitted to eating a large breakfast that morning. Once he realized that the group, made up of his peers, would really be eating pie at all three stops, he tucked away his energy bars into the deep recesses of his saddle bag. First stop: Seattle Pie Company in Magnolia. They always have a great assortment of flavors, may with crumb toppings. I had the Strapple (strawberry apple). Missing from our group was David, a Magnolia resident and pie aficionado. We went in search of him, but didn't find him at home, either. Where was David? On to Discovery Park, back through Fremont and on to Montlake where we visited our old friend, Fuel Coffee at Montlake. 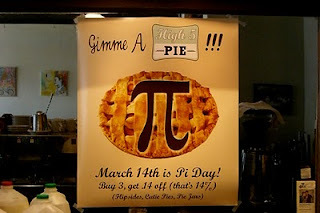 We had a contest for the first person to recite the most digits of Pi: 3.141592 is where most people ended. Then, Becky took a lucky guess of "6" and she won a free coffee. Maybe she should buy a lottery ticket! 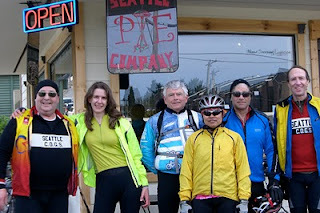 From Montlake, the riding got serious and we went many miles of pure pedalling, not so much pie eating. Down to Lake Washington, up through Mt Baker Park and Boulevard, and up my new favorite road, Cheasty Boulevard. A climbing traverse along a tree-lined road for over a mile, leading to Beacon Ave (or Bacon Ave, as I was getting hungry again). Descend over the Green Bridge, climb up Jackson and head north to Capitol Hill. There, we had 2 pies awaiting us that I had special ordered: Cherry Almond and Apple, two of the best pies that Fuel's High Five Pie makes. We weren't sure we could eat both of them so Emily offered to take home the leftovers. But in no time, we were working on the second pie and then there was only one slice remaining which I tucked into my saddlebag for later. Descending through Interlaken Boulevard, we all thought about what a beautiful city and part of the country we live in, having a park to ride through, nearly car-free. Similarly, I was thinking about how lucky we were to have such great bakeries all within riding distance.